Independence Day has a special meaning for me – it’s my birthday. Yup, a genuine Yankee Doodle Dandy. My brother too. He was born exactly a year later than me. The timing of these events seems odd, except when you consider that my father was a watchmaker at the time (he had good timing) and that his birthday preceded ours by nine months. But that’s another story. Every year, our birthday is celebrated with a parade and fireworks. Growing up, I thought that was rather special; a parade and fireworks for my birthday … how cool! I don’t know exactly which year it was when I realized that the fireworks were for our country, not specifically for us, but that did not matter. I could always count on festivities drawing people together for my birthday, topped with fireworks at the end of the day. Growing up, Independence Day fireworks were an all day event. 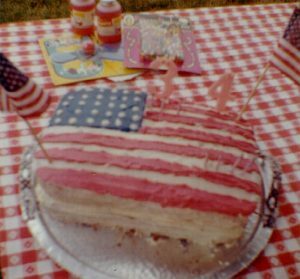 Every year, my mother would make a cake decorated like the American Flag. 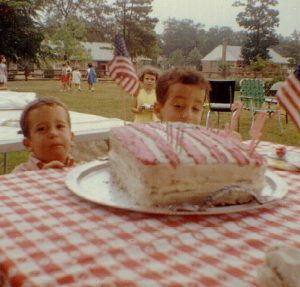 Every year, we’d take the requisite pictures of my brother and I sticking our fingers into the cake and taking a taste. It was always a time for gathering friends and family for a party (mine and my brother’s), eat cake, swim in the pool, play volleyball, laugh with friends and finally watch the fireworks. It’s the day of my birth. No, I don’t claim to remember this day. Perhaps my parents had planned to see the fireworks this evening, maybe to encourage my birth. But I interrupted them before they had the chance. No, they would not get to see the fireworks in person this evening. They spent Independence Day in the Hospital waiting for me to arrive. And when I arrived, perhaps there WERE fireworks, just of a different kind. I’m seven. This is the first year I can remember seeing the fireworks up close. The Baseball Field in Gibbsboro was the site of my area’s fireworks for many years. It’s also the site where some years later I would play on the Little League team; where I’d be daydreaming in right field only to have a fly ball land in my glove quite by accident. But that’s yet another story. This night, I was sitting with my Mom, Dad, and Brother on a blanket near the ball field. They were “small town” fireworks, but to this seven year old, they were overwhelming. I had never seen anything like it and I was in awe. I’m 11 years old. My brothers were 10 and 3. I can remember 50 or more people at the house for the party. This was also the year that my father started letting us go up on the roof to watch the fireworks in the neighboring town. No, not the three year old – he knew better than a certain celebrity who introduced his infant to perilous heights by hanging him off a balcony. Just the two older children, the ones who shared birthdays with the country. He set the ladder on the side of the house, and up we climbed. If you’ve never seen fireworks from the roof, you should try it. If you thought your heart raced watching from the ground, just try it in the air … but be safe. I’m 22. My girlfriend and I ride on my motorcycle to Penn’s Landing to see the fireworks. Just she and I. It’s a whole new display when viewed from a motorcycle parked on an overpass above Penn’s Landing with the one you love (wink, wink … nudge, nudge). Yup, there’s a wedding in our future, and it just doesn’t get any better than this. Unfortunately, this would also be the last year my Mother saw fireworks. She never got to see us wed.
I’m 32. 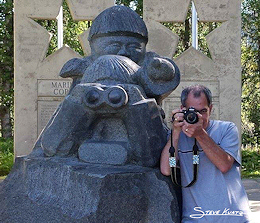 Married with two children of my own (one more coming, but I did not know it at the time). We’ve been in our new home for about five years now, just a mile from the High School where the fireworks will go off. Family and friends are there to help celebrate. This is the first time we took our children to the fireworks. I remember MY first fireworks and am very excited for my children. We sat through about five minutes but had to leave because the noise was upsetting my youngest child. C’est la vie. There will be other fireworks. My oldest child is ten years old. I notice that the celebrations are getting smaller, with fewer family and friends joining us. We’ve moved again and are just three blocks from the fireworks this year. After the B-B-Q, we’re close enough to walk as a group to the High School. What a joy just to see the look on my kid’s faces as they watched the fireworks. Fireworks would explode, and faces would light up to reveal smiles. And between bursts, laughter and screams. “More, more!” Now THAT’S what I’m talkin ‘bout. My youngest child is 10. I take the two boys onto the roof to watch the fireworks. No ladder required, as my bedroom window has easy access to the roof. How very cool to be able to give to my children what my father gave me. In the words of Harry Chapin, “All my life’s a circle”. 2005. This would be my Father’s last fireworks. Friends who came over to celebrate with us walked over to the High School to get a better view of the fireworks. My father was tired and did not want to walk. So he and I sat in my back yard and watched through the trees. If you’ve seen fireworks you know there’s lots of smoke. But did you know that fireworks produce a lot of ash too? My Father and I found out that year because we heard the ash fall like rain through the leaves on the trees. We watched the fireworks through the leaves. We watched the eerie shadows cast by the leaves as the fireworks were launched and eventually fell. We talked between bursts. We laughed. We listened to the ash fall. I think 2005 was my favorite year for fireworks. 2007. July 6th. 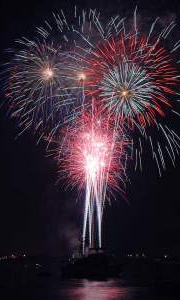 The parade and fireworks on the 4th were canceled due to inclement weather. That really put a damper on the day, but I don’t mind. This is the first year I can remember there being rain on July 4th … ever … so I count myself lucky. The Fireworks were rescheduled for tonight. Because of the delay, there are none of the usual celebrants to share the fireworks with. The kids are inside with a couple of their friends watching movies and playing video games. No one seems interested in the fireworks. How anticlimactic. So here I am. By myself. Up on the roof. Fireworks explode just beyond the trees. Smoke drifts overhead. Ash falls on the leaves. The Finalle comes. Beautiful lights. Eerie shadows. Explosive sounds. More smoke and ash. From the roof I see my neighbor watching the display from his back yard … alone. I wonder what he’s thinking about. Thanks Mom & Dad. That was beautiful. 2010, my 50th year. It’s July 1, not quite time for fireworks. And as if to punctuate the fact that I’ve been sharing my fireworks with my brother for 49 years, this July 4th is surrounded with much to celebrate. My oldest graduated from college, moved to New York, and has a job he enjoys. Oh my – he’s on his own! My middle child is happily working and dancing her way through life, and is a joy to have at home. My youngest is graduating High School, wrote and produced a full length musical, and will be going to California for college. So much to be thankful for. It seems that as the years push on, I’m sharing my fireworks with more and more people. And that’s just fine by me, because it means more celebrations and more joy. Besides … there are plenty of fireworks to go around. 2013. You do the math. Another thunder storm? We’ve been getting a lot of rain these past weeks. No? Oh, it’s fireworks! Washington Township planned them for the day before the 4th this year, a Wednesday. Strange, but it is what it is. We weren’t planning to go this year, but I took my requisite walk outside to just have a peak – to say I saw them. Oh right – the Township also moved the fireworks from the high school a few blocks away, to the park a mile or so away. Now it’s not possible to see them from our yard. Second floor window? Nope. The roof? Maybe a hair. Heavy sigh. So I just stood there for a moment to listen and reflect on the year. As a family, we’ve been having a good couple of years. Brian has a job as a light tech on a cruise ship, and is literally cruising around the world doing what he loves. Hillary is still dancing, doing crafty things and holding a full time job – and it’s lovely to have her home. Josh went to college with The Young Americans (a touring, performing arts college) and has been traveling the world doing workshops with kids. Karen has been back in the workforce for some time now doing what she loves. And she won a trip for two to Portugal – go figure! My own business continues to grow. We have a new niece! We’re all healthy. And as always, Karen and I live vicariously through the kids. Lots to be thankful for. And at the moment, Josh is home and we’re busy working on one of his shows, which opens (and closes) this weekend, Friday & Saturday. If rehearsals are any indication, this is going to be a great birthday present. <shameless plug>Come out and see Warehouse the Musical!</shameless plug> This is the 3rd summer that Josh has come home from college to produce live theater. And theater around here has become a family affair: Josh writes and directs, Hillary choreographs, and Karen & I help with the production aspects. If Brian were here, he’d be working on lights and tech but he’s currently cruising off the coast of Russia. The garage has become a scene & costume shop. Things are certainly taking a turn on the birthday scene. But I’m still with family, loving what we do together. It’s all good. It’s a very rewarding way to spend my birthday. Thanks everyone. I love you. It’s been quite a year. About 11 months ago, I had a heart attack. I’m doing OK now. But not a day goes by that I don’t think about it. Turns out, it’s in my genes; three out of four of my uncles died as a result of heart attacks before they made it to 60. Fortunately, medical technology has come a long way since then, and my prognosis for a long life is good. This time around, it gives me pause. I remember loosing my mother who passed way too early, and later my father who thankfully had a long, fulfilling life. I remember those in my family who no longer have a chance to enjoy fireworks. 11 months ago, that could have been me. I know it sounds cliche, but I’ll never take life for granted. And I am grateful. I’m grateful for my friends and family, for the opportunity to enjoy life, and participate in my children’s lives. I’m very lucky in so many ways. I’ve always been an optimist, but now it seems I’m seeing the good in almost everything (hence the conversion of this blog to a photo blog). I can’t see going through life with any other attitude. It’s really a great way to feel, and I look forward to experiencing many more wonderful things. There are so many more fireworks to see.